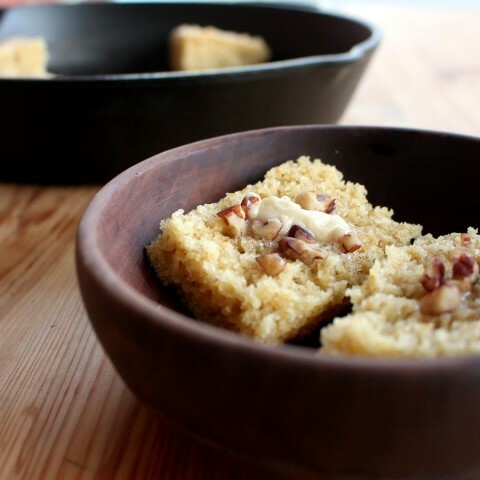 Back to this amazing cornbread with maple butter, which is why I’m sure you’re here. The inspiration for it came last weekend, after a several mile hike which included several thousand stairs. (See my previous post here for more about that.) That kind of a hike builds an appetite. On the way home, Tyler and I stopped at Smokey Bones to enjoy some ribs where they served us an amazing appetizer of cornbread and maple butter. That was the best cornbread and butter I have ever had. Maybe it was just because we were starving, but it was gone in less than two minutes from the time it hit the table. The whole time I was eating it, it was screaming to be recreated in my kitchen. So here is my version which Tyler claims to be better than the restaurants. Maybe it was because I left the pecans out of his portion though. The cornbread is a classic cornbread recipe adapted from Like Mother Like Daughter Food. 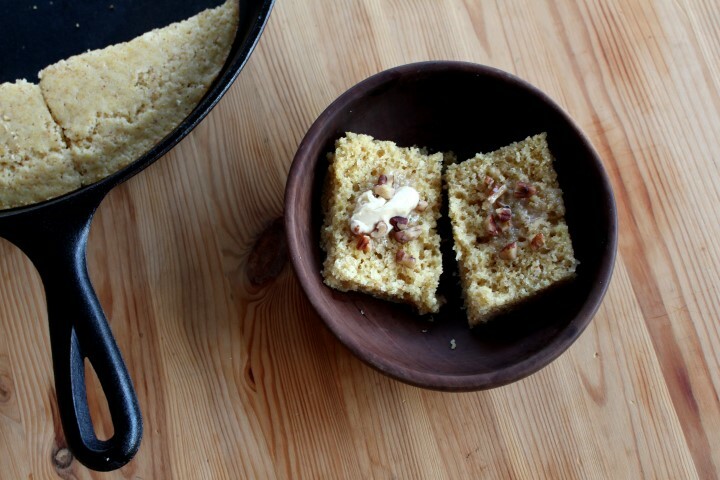 The recipe is simple and makes a wonderfully fluffy cornbread with a tender crumb. The butter is a recreation of those wonderful flavors swirling in my head. Preheat oven to 400 F. Grease a 12 inch round cast iron skillet. Or a regular old 9 x 13 pan would work, but it lacks the charm. In a medium bowl, cream butter and sugar together until smooth. Beat in eggs. In a small bowl, whisk together the flour, corn meal, baking powder and salt. Alternately whisk in a third of the flour mixture with a third of the milk until combined. Pour into greased pan and bake for 23-25 minutes. To make the maple pecan butter, whip the butter with a mixer until fluffy. Add the maple syrup and molasses and beat for another minute. Gently stir in pecans. Serve the cornbread warm with a generous amount of butter. Love that butter Mallory, this sounds so incredibly good right now! I so glad the corn bread turned out for you and that maple butter looks amazing! I can’t wait to try it!! Thanks, Aimee! It was great! Well I think you’re off to a good start, your photos are beautiful! And this bread is mouthwatering! Thanks, Kelly. I’m excited to keep practicing! I LOVE the thought of pecans in the maple butter – sounds amazing!! I know and since nuts are good for you… we don’t have to feel guilty right? cornbread is one of my favorite things, we grew up on it. I think that maple pecan butter sounds incredible! I have made a version of maple pecan butter but would have never thought to put it on cornbread! Sounds like a great combo to this Southern girl! thanks! Oh, its an awesome combo. Thank for stopping by, Jenna. Congrats on the new camera! I am still trying to figure mine out after a year, ugh!! Anyway, cornbread – heck yes! I’ve been craving it lately and love the maple in your recipe! Thanks, Jessica. It’s been awesome! I absolutely love cornbread and your maple pecan butter looks absolutely decadent. Cannot wait to try this. That maple pecan butter sounds amazing! Hi, Mallory! This sounds DIVINE! Pinned and tweeted! That is fun stuff! I have not ventured there yet 🙂 Your second pic is my favorite! And this maple pecan butter … delicious! Thanks, Mary. It’s actually easier than you think after you dive in. 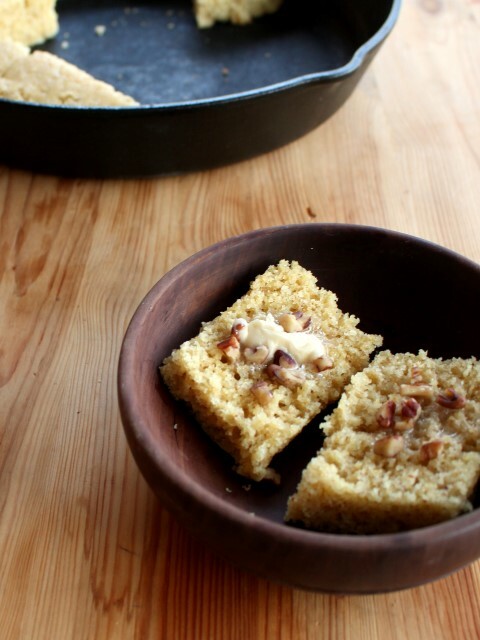 That maple pecan butter sounds like it’ll make an already tasty cornbread even better! I hope you can stop on by and share this or any other recipe with us on Five Friday Finds! This looks so yummy. I wish I had it for breakfast right now! Thanks for sharing it at my Creative Ways Link Party. It will be one of the features at tonight’s party. Hope you’ll link up again tonight!